MUNICH -- Germany's three premium automakers made strong gains in global sales last month and all three predict the positive trend will continue. 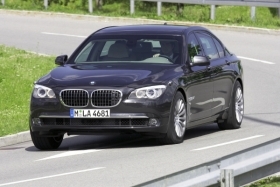 BMW AG's retail volumes increased 11.5 percent to 107,686 vehicles last month. One of the big winners was the 7 series. Sales of the upper-premium car rose 57.1 percent to 5,025 compared with the same month last year. Through November, sales of the global premium car leader's BMW, Mini and Rolls-Royce brands were down 12.2 percent to 1.16 million vehicles. The good news for BMW is that the year-on-year decline keeps shrinking. In June, half-year sales were nearly 20 percent off compared with the same period in 2008. "Since September, sales have been back on the growth track. In November we achieved another substantial increase in global deliveries. We intend to continue this trend in December," BMW board member for sales Ian Robertson said in a statement Tuesday. Audi sold 82,750 vehicles last month – up 8.9 percent -- bringing volumes to 870,600 in the first 11 months and narrowing its cumulative year-on-year decline to just 5.4 percent. Daimler's Mercedes-Benz Cars division sold 98,400 vehicles last month, a 16 percent increase from the year before. Through November, the division, which includes the Mercedes-Benz and Smart brands, has sold a combined 1,021,700 cars, down 11.8 percent compared with the same period last year. That is an improvement over the 19.3 percent decline in year-on-year sales the division after six months. "In November we built on October's positive development and once again significantly increased sales worldwide," said Joachim Schmidt, Mercedes' head of sales and marketing, in a statement on Monday. The company expects its overall fourth-quarter sales to be significantly higher than in the prior year because of models such as the new-generation S class and the extension of its E-class lineup. "Additional sales momentum will be generated over the next few weeks by the new E-class station wagon, which reached the dealerships on Nov. 21 and has been a big hit with customers," Schmidt added.